I am a 1976 graduate of the College-Conservatory of Music at the University of Cincinnati, with studies in piano, organ, and composition. 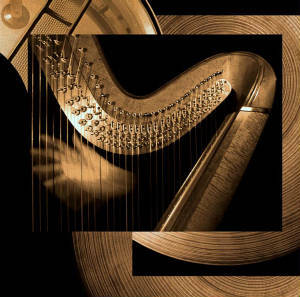 I began my harp studies a bit later in life with the then-chair of the Conservatory's harp department, Ulrike Brinksmeier. I have worked in church music as an organist and choir director since 1970. I have handbell music published by the American Guild of English Handbell Ringers, and have written choir anthems on commission for churches in New York, Ohio, Florida, and Georgia. In 2004 I relocated to St. Louis and currently reside in Benton Park, near Soulard. To provide my clients with exceptional music. To handle all inquiries and transactions promptly and courteously. To provide clients with complete details on prices and services by the time of booking. If you'd like to see the basic size and type of instruments I own, click on the links below. Gut-strung chamber harp, Thormahlen Swan. Mine is the walnut one on the right. Wm. Rees Celtic harp "Aberdeen"